A video has surfaced online which shows the awkward standoff between a truck driver and a toll collector, where both refuse to stretch ten centimeters so a ticket can change hands. 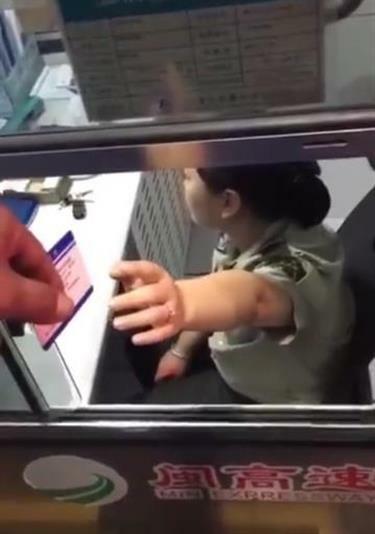 A video of a toll collector and a truck driver in a standoff, remaining completely motionless for nearly one minute, was widely spread online after neither party was willing to reach a few extra centimeters so that a toll ticket could change hands. The incident happened in the wee hours of September 22 at a toll station along Nanjing-Gaoze Highway in southeast China’s Fujian Province, The Beijing News reported today. The driver, surnamed Chen, had the toll ticket in his hand, but refused to unbuckle his seat belt to reach out and pass the ticket to the collector, while the collector, surnamed Liu, stretched out her hand as far as she was willing while remaining seated. There were roughly 10 centimeters between the pair, but neither would give in. The deadlock lasted around one minute, during which time neither said a word. Liu refused to even look at Chen. Liu then closed the window and ignored the truck driver. The highway management company in Fujian Province confirmed the incident, explaining that before the video — which was shot by the driver — was taken, Liu had stood up several times trying to take the ticket, and asked Chen to reach out more, but he stubbornly refused. Apparently irritated by the prank, Liu reacted indifferently afterwards. The company has "educated" Liu, although many netizens supported her stance. Some criticized Chen for teasing her, suggesting that his actions constituted harassment and disrespect.